Spinal cord injury (SCI) is one of the most common devastating injuries, which causes permanent disabilities such as paralysis and loss of movement or sensation. The precise pathogenic mechanisms of the disease remain unclear, and, as of yet, there is no effective cure. Mesenchymal stem cells (MSCs) show promise as an effective therapy in the experimental models of SCI. MSCs secrete various factors that can modulate a hostile environment, which is called the paracrine effect. Among these paracrine molecules, exosome is considered to be the most valuable therapeutic factor. Thus, exosomes from MSCs (MSCs-exosomes) can be a potential candidate of therapeutic effects of stem cells. The present study was designed to investigate the effect of whether systemic administration of exosomes generated from MSCs can promote the function recovery on the rat model of SCI in vivo. Researchers from Fujian Medical University observed that systemic administration of MSCs-exosomes significantly attenuated lesion size and improved functional recovery post-SCI. Additionally, MSCs-exosomes treatment attenuated cellular apoptosis and inflammation in the injured spinal cord. Expression levels of proapoptotic protein (Bcl-2-associated X protein) and proinflammatory cytokines (tumor necrosis factor alpha and interleukin [IL]-1β) were significantly decreased after MSCs-exosomes treatment, whereas expression levels of antiapoptotic (B-cell lymphoma 2) and anti-inflammatory (IL-10) proteins were upregulated. Further, administration of MSCs-exosomes significantly promoted angiogenesis. Cresyl violet–stained sections were analyzed for lesion and spared tissue area at 28 days post-injury. 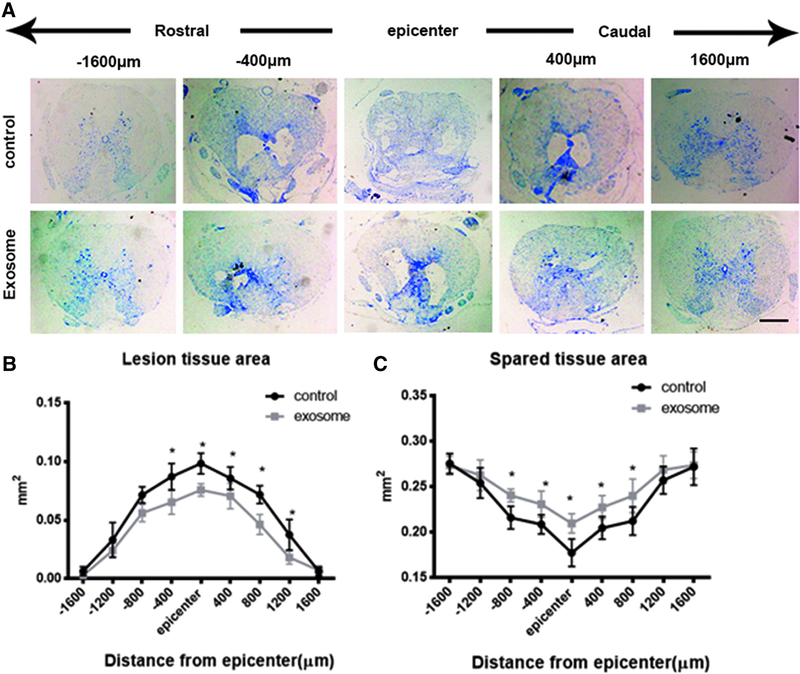 (A) Representative micrographs of spared and lesion tissue treated with phosphate-buffered saline (PBS; control groups) and MSCs-exosomes (exosome groups) at 28 days post-injury in the injury site and in spinal segments 1600 μm rostral and caudal to the injury. (B) Quantification of lesion tissue area within the injury site and 1600 μm rostral and caudal to the epicenter treated with PBS and exosome at 28 days post-injury. (C) Quantification of spared tissue within the injury site and 1600 μm rostral and caudal to the epicenter treated with PBS and exosome at 28 days post-injury. Data are presented as mean ± standard deviation, n = 5 in each group. *p < 0.05; **p < 0.01. Scale bar = 1 mm. MSCs, mesenchymal stem cells; SCI, spinal cord injury. These results show, for the first time, that systemic administration of MSCs-exosomes attenuated cell apoptosis and inflammation, promoted angiogenesis, and promoted functional recovery post-SCI, suggesting that MSCs-exosomes hold promise as a novel therapeutic strategy for treating SCI.